The new 3-liter slim PC XC60J features robust performance with a fanless design, powered by the latest Intel® Apollo Lake SoC 14nm processor. This new model provides excellent peripheral connectivity via built-in eight COM ports to power highly interactive Kiosk, vending machine, and POS applications. With integrated Intel® HD graphics, the XC60J can support 4K/Ultra HD video playback and deliver dual displays via HDMI and D-sub. 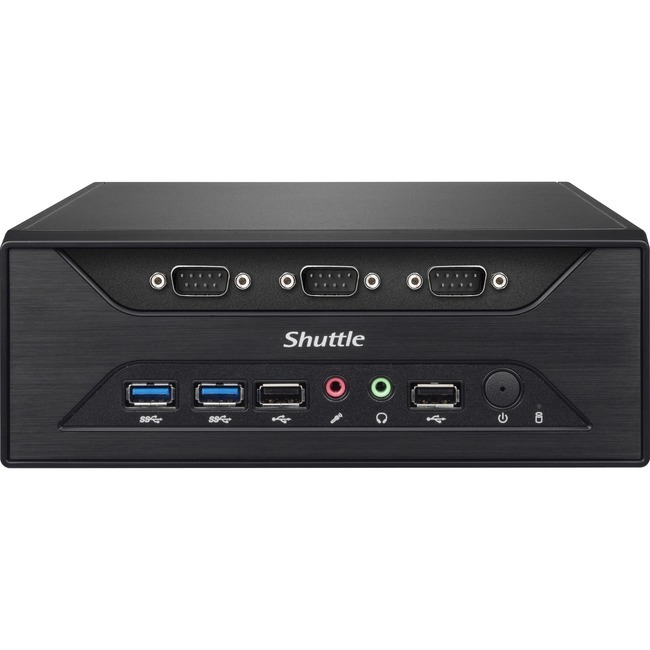 The XC60J offers two USB 3.0, four USB 2.0, SATA 6Gbps, and built-in Intel® Gigabit LAN. Built-in M.2 2280 Type M and M.2 2230 type A expansion slots allow users to install SSDs, Wi-Fi modules, or other such devices to boost the capabilities of XC60J. It is 24/7 certified, operable 0-40 °C environments, and VESA mountable, ideal for versatile applications. The all-new XC60J supports Intel® Apollo lake platform technology, equipped with 14 nm Intel® Celeron® J3355 dual-core processor. Support 1.35V DDR3L low-voltage memory with a maximum capacity up to 8GB, able to reduce thermal energy production and overall energy consumption. The XC60J features seven RS232 and one RS232/RS422/RS485 ports which support 0V/5V/12V as well as four USB 2.0 and two USB 3.0 ports. Connect to barcode scanners, receipt printers, keypads, and other peripherals. The XC60J is easily configured into peripheral-heavy POS, Kiosk, and Digital Signage systems. The Intel® Apollo Lake processor is built-in HEVC/H.265 and VP9 video decoding. The XC60J can decode the video with the latest generation codecs and reduce CPU utilization with lower power consumption. The XC60J is suitable for 0 ~ 40 ℃ working environment to meet the environmental operation demands of commercial applications. With Intel® Apollo Lake platform technology, the XC60J features native SATA 6Gbps and USB 3.0 high-speed storage interfaces. A USB 3.0 port which supports up to 5 Gbps and provides 10 times greater data access speed than a USB 2.0 port. The XC60J is VESA mount compliant and allows for versatile integration into hardware systems. This space saving capability is well-suited for digital signage applications with limited space. The XC60J uses a thermal module with cooled heat pipe and sink to transmit heat throughout the system quickly and evenly. The unique fanless design reduces the power consumption required by a fan as well as the cost of replacing fans. Use with solid-state disks and create an operational platform completely free of noise. The XC60J is support 4K high resolution (3840x2160) via HDMI video output. Now with four times the resolution of Full HD, viewers can enjoy the super detailed and crystal clear imaging of 4K. Display imaging on up to two screens via HDMI and D-sub video outputs. Use an adaptor to convert HDMI into DVI interface for diversified signal selection.